In a civil construction environment, the temperature of concrete during the curing process need to be measured and recorded to evaluate the process of curing and removal of frame work thereafter. In this process, the temperature can be continuously recorded. 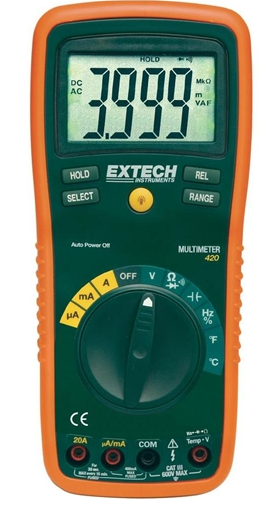 There are temperature data loggers with external thermocouple probes. The data logger will have capacity of readings such as 8000 readings for a model being supplied by Cryopak, USA as seen in this image. If data is taken every 10 minutes this means a recording capacity of 55 days. However for concrete curing, 7-10 days’ readings only are required and hence a model with 8000 readings is more than sufficient. A thermocouple can be inserted into the data logger. any type and length of thermocouple can be used. 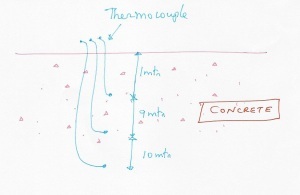 The thermocouple can be inserted into the concrete before curing start the recordings on the data logger. The current temperature will always be displayed on the LCD screen and the recording also will take place. When the recording is over, remove the thermocouple from the data logger. You will have to leave the thermocouple in the concrete since it cannot be removed now after the concrete is cured. 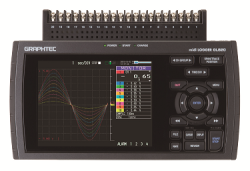 The data logger can be reused using a new thermocouple. The data logger can be connected to a computer and the data can be downloaded. In this method, recording will not happen. Thermocouple wires are cheap cables used to measure the temperature. 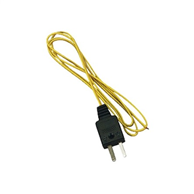 Thermocouple wires come in different length such as 1 meter, 10 meter, 50 meter, 100 meter etc. During the concreting process, the thermocouple can be inserted into the concrete at various points. The thermocouple has two ends viz. one end which measures the temperature and the other end consisting of a pin to insert into a measuring device. The end with the pins should be kept outside the concrete works. Whenever readings need to be checked, the meter can be inserted and the readings can be taken. In the example shown in this image, thermocouple probes are inserted at 1 meter, 10 meter & 20 meter. The connecting pins are kept outside the concrete. You can take measurement using a meter at different times. The thermocouple cannot be taken back after curing because it has gone deep inside the concrete. However this will not be a major concern, since the wire is very thin and very cheap. The meter for taking measurement also is shown over here. There is a small plug at the bottom t o which the pin can be inserted. The selector switch at the front has to be switched to °C upon which the temperature of the concrete will be automatically shown. One of our sales engineers will contact you. We have gone through your website, we intend to buy a data logger system that can monitor concrete temperature during placement. Kindly recommend us a system that will best suit this task, also share complete specifications & videos of the working equipment. We need to get this in Pakistan at Karachi port. Please note that the system must be re-usable & we intend to recover the sensors as well. One of our sales engineers will contact you. However please note that the sensor (Thermocouple) will not be reusable because it goes into the concrete and cannot be recovered. However the same is very cheap and will be available in your country.